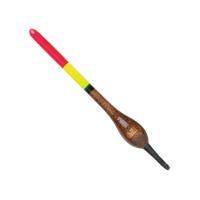 Size: 3 3/8" / 3 7/8"
The Thill Gold Medal Center Slider Floats works great as an all around slip float for deep fast flowing rivers or still waters. These floats are also great for vertical jigging techniques or ice fishing. 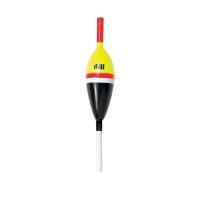 The Thill Wobble Bobbers feature an aerodynamic shape and internal weighting system makes them the longest-casting slip float you can buy. 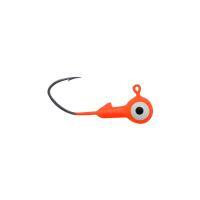 The shape and weight design of the Thill Wobble Bobbers also gives the angler another advantage, each wave produces an exaggerated jigging action that is transferred to the bait or jig below. 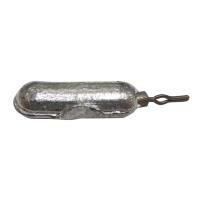 Thill Wobble Bobbers provide greater distance and accuracy than any other slip float. Available in sizes for everything from panfish to walleyes to salmon and steelhead. 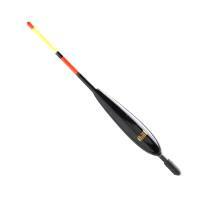 The Thill Turbo Master Floats feature balsa bodies and wire stems designed to make it easy to control float speeds. 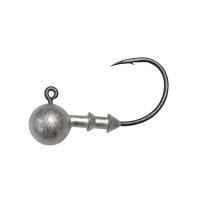 Fast water flows around the thin wire stem to keep baits drifting closer to the stream bottom. 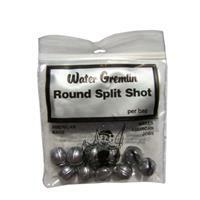 These floats are ideal for steelhead, salmon, trout, walleye and catfish. Available in five sizes. 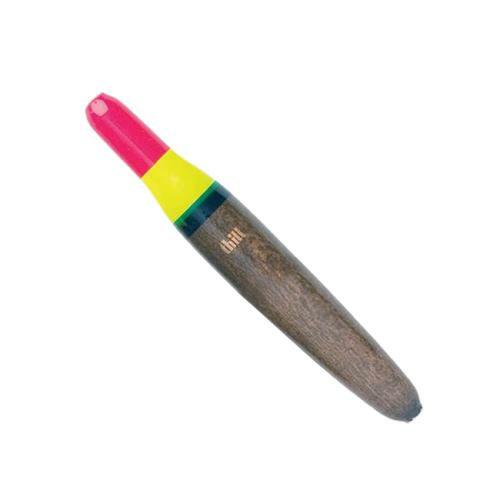 The hi-vis tip is easy to see in any light conditions. The two included silicon sleeves make changing float sizes a breeze. Floats come one per package and are made in the U.S.A. The Thill Crappie Corks feature a lateral line, allowing you to detect even the lightest of bites. 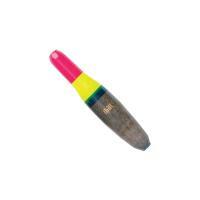 Suggested lure weights are printed on the Thill Crappie Corks making selection easy. 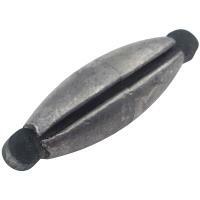 The Thill Crappie Corks feature a small diameter insert that grabs the bobber stop removing the need for a bead. The spring on the bottom stem also allows for fixed float rigging. With the proper amount of weight, the cork floats on the lateral line. 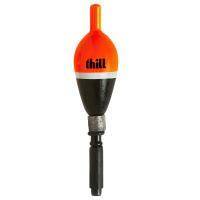 The Thill Pro Series Slip Floats are the most slippery and line-friendly slip float around! The Thill Pro Series Slip Floats feature line friendly brass grommet inserts that allow the line to easily pass through. The tops feature brightly colored chartreuse and orange paint for high visibility in all conditions. 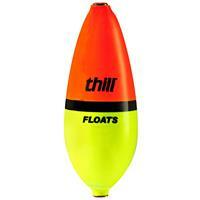 The Thill Pro Series Slip Floats feature premium balsa construction. 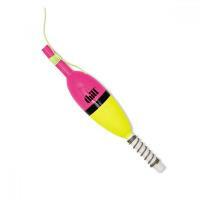 The Thill Mini Shy Bite Float detects the slightest of bites. Matched with a small hook and split shot or a micro jig, this slender float is great for panfish and trout in still waters. 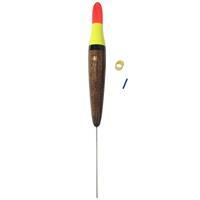 We carry the Thill Mini Shy Bite Float in 2", 2 1/2" and 3 1/8" sizes. 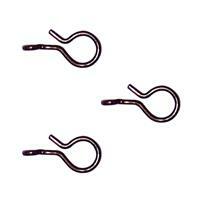 These floats come 2 per package and include float sleeves for line placement. 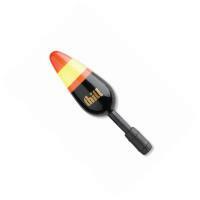 The Mini Shy Bite features a hi-vis orange/yellow top for easy visibility on the water. The Thill Gold Medal Center Slider Floats are made in the U.S.A. Comments: Not used yet. Bought for backup to similar in tackle box. Comments: Was using a regular bobber. And found that shy crappie would fill the pull from a larger bobber and let go. Also believe that with a 1 1/2 foot leader they could see the bobber. Haven't had the crappie year in San Diego that we had last year so doing what I can to increase my chances. So far I have doubled the last 2 weeks from the rig I was using before. Like the camo on the bottom of this bobber and it pulls down easy. 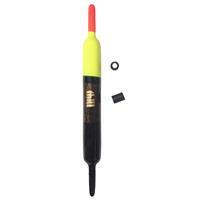 The Thill Premium Bobber Stops are made of high-vis, fluorescent-colored, fine-diameter material. The premium quality thread easily grips monofilament line and resists fraying. The Thill Premium Bobber Stops are available in three colors. 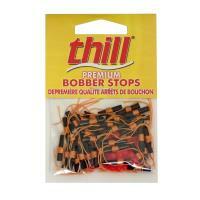 Each package contains 40 Thill Premium Bobber Stops. 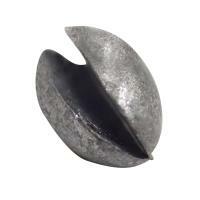 Bullet Weights Egg Shot Sinkers are weedless split shot sinkers that are egg shaped and designed to pinch onto the line. These weights are made of lead. The size 10 and 9 weights come 60 per pack, the size 8 comes 40 per pack, the size 7 comes 30 per pack, the size 6 comes 24 per pack, the size 5 comes 22 per pack, and the size 4 comes 20 per pack. 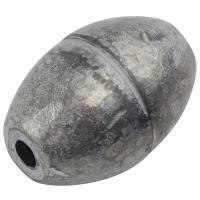 Bullet Weights Finesse Drop Shot Sinkers are designed for finesse style fishing and will slip on the line without having to tie a knot to hold it into place. These weights are made of lead. Strike King Mr. Crappie Slab Slasher Jig Heads are built around a #2 black nickel Eagle Claw hook. These jig heads are extremely strong, sharp, and feature a unique bend that maximizes the power of your hook set. Mr. Crappie Slab Slasher Jig Heads offer bright, eye-catching colors that fish can't resist! Charlie Brewer's Crappie Slider Grubs are proven to catch crappie, panfish, bass, and more. 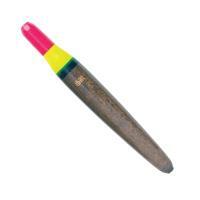 These grubs feature soft, colorful bodies and an enticing slow falling, vibratail action, irresistible to fish. Charlie Brewer's Crappie Slider Grubs are great for casting, trolling, or vertical jigging. Gamakatsu Round 211 Jig Heads feature an unpainted round head and are constructed with a short shank and come with a matte black nickel hook. 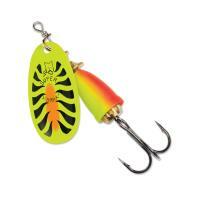 The jigs have two keeper rings that help keep bait firmly secured. These jig heads are great for live and finesse baits.